Great news from Sun Healthcare’s football team – we’re through to the next round of The FA People’s Cup! Our team, Sun City, (affiliated under Pinfold Pumas), plays in Barnsley and is made up of around 20 players with disabilities. The team are all excited to be taking part in The FA People’s Cup again and we’re hoping to do as well as last year when we came 3rd overall! 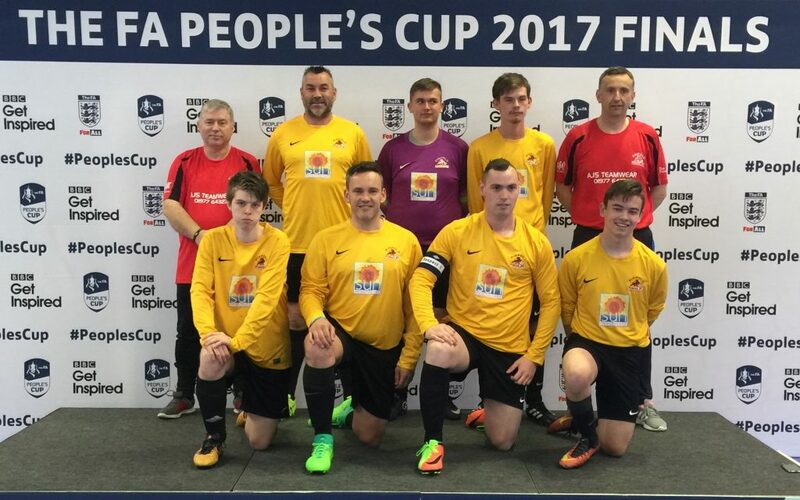 Our team at the FA People’s Cup 2017 Finals – we came 3rd across the UK! 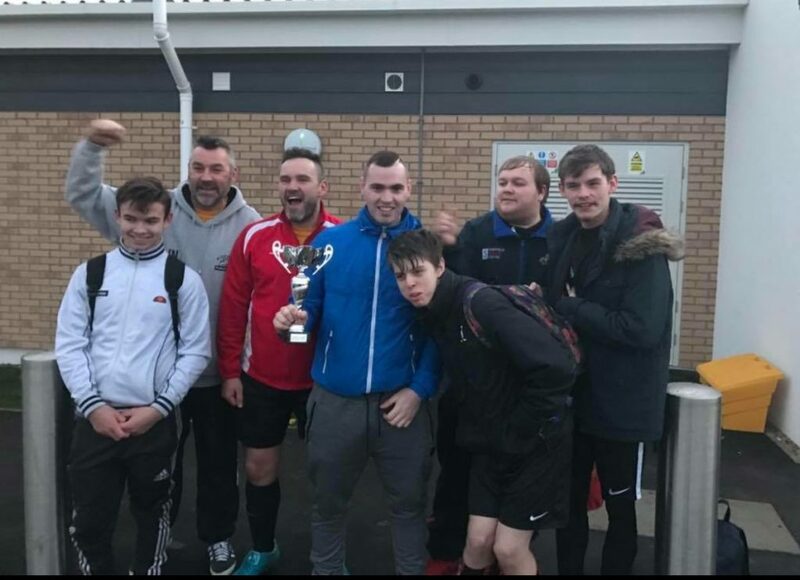 Jason Stokes, a Senior Support Worker at Sun Healthcare and football coach for local Junior Football Club, Pinfold Pumas, set up the disability football team in 2015. The idea was to enable people with disabilities to enjoy all the benefits of playing football as a team. Our inspirational players have different disabilities including learning disabilities, cerebral palsy, autism, visual and hearing impairments. What they all have in common is a desire to enjoy playing sport together. Our team welcomes anyone with disabilities who wants to join us, and we have 3 different teams to cater for people’s varying abilities. We’re also proud that one of our players, Luke, is working towards his Level 1 Coaching Qualification this season. This is an opportunity we are offering our players if they want to take up coaching. The FA People’s Cup is a small-sided competition for male, female and disability players. There were over 45,000 people in 7,500 teams involved in the first round of the Cup this year. 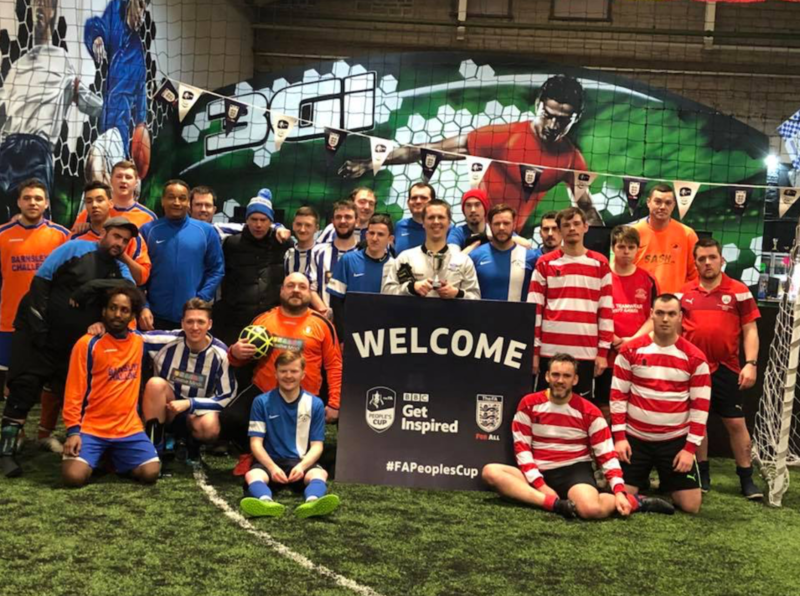 Sun City have entered a team of 7 players into the disability players category of The FA People’s Cup and we’re really pleased to have got through to the 2nd round. We’re hoping to recreate some of our success from 2017, when the team won the regional qualifiers and then came 3rd overall in the UK – an amazing achievement! Have a look at the video below of our team being filmed for TV during the tournament last year. As well as the FA People’s Cup we have also entered 3 of our teams into the West Riding Ability Counts League. We have mixed teams of male and female players of different abilities. We’re also considering setting up a walking football team too, so do let us know if that’s of interest. We currently train at Dorothy Hyman Sport Centre, Cudworth, on Tuesday evenings from 7-8pm. If you don’t want to play but would like to get involved then you can also come down to watch us train, help us with set up and admin or support the team in any way you’d like to join in. And, keep an eye on our Facebook page for updates on our progress through The People’s FA Cup. Good luck Sun City!